558 pages | 58 B/W Illus. Extensive coverage of the major issues including climate change, air and water pollution, sustainable development, and environmental justice. Dedicated chapters on a full range of resources including water, land, forests, fisheries, and recyclables. Introductions to the theory and method of environmental economics including externalities, benefit-cost analysis, valuation methods, and ecosystem goods and services. Boxed ‘Examples’ and ‘Debates’ throughout the text which highlight global examples and major talking points. The text is fully supported with end-of-chapter summaries, discussion questions, and self-test exercises in the book and multiple-choice questions, simulations, references, slides, and an instructor’s manual on the Companion Website. 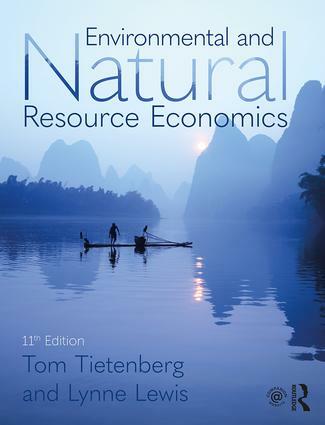 Tom Tietenberg is the Mitchell Family Professor of Economics, Emeritus at Colby College, Maine, USA. Lynne Lewis is Elmer W. Campbell Professor of Economics at Bates College, Maine, USA.